“At this meeting, we shall implement the 9th activity by publishing the final register of voters for the 2019 general elections as required by law. In fulfilment of this legal requirement, the commission has made available to each political party a copy of the entire national register of voters. In the final register presented, yesterday, Lagos State accounted for about 6.6 million voters, followed by Kano with 5.5 million registered voters. When viewed according to regions, the North West has the highest number of registered voters with over 20.2 million, followed by South-West with 16.3 million voters. The South-East has the least with slightly over 10 million voters; North East, 11.3 million; North Central, 13.4 million; and South-South, 12.9 million. Also male voters constitute 44.4 million, while females account for 39.6 million voters. 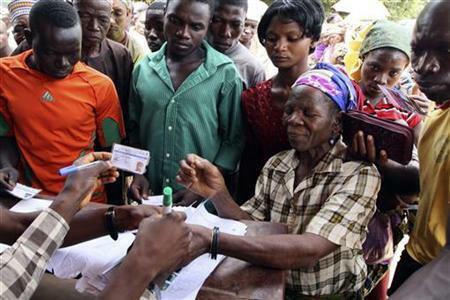 Yakubu added that the commission had printed and delivered the Permanent Voters’ Cards, PVCs, to the states for collection by registered voters, urging all registered voters who have not collected their PVCs to approach any of INECs local government area offices and other designated collection centres nationwide to pick up their cards. He said; “For clarity, I wish to stress that the function of the Smart Card Reader during accreditation is to confirm, verify and authenticate the voter. First, it shall be used to confirm that the PVC is genuine and issued by INEC. Cloned cards or cards that do not match the codes for a particular polling unit in which the voter is registered will be rejected by the Card Readers. Secondly, the Card Readers shall verify that the voter who presents the PVC is the actual owner of the Card by ensuring that the personal details on the Card Reader are consistent with the manual register for the polling unit. Thirdly, the Card Reader shall be used to authenticate the fingerprint of the voter as an additional confirmatory procedure. If the fingerprint is not authenticated by the Card Reader but the PVC is confirmed as genuine and the voter’s personal details are consistent with the manual register, he/she shall be allowed to vote. “However, where the biometric authentication fails, the voter will be required to thumbprint a box next to his/her picture on the register and to enter his/her mobile telephone number before proceeding to vote. The Commission has modified the Register of Voters for the 2019 General Elections accordingly. Consequently, the separate Incident Form used in previous elections which is only completed by the Presiding Officer without the involvement of the voter is now abolished. Similarly, the claim that the Card Reader has been enhanced to recapture voters’ fingerprints at polling units and automatically overwrite the biometric record on our database is untrue and should be disregarded. “As the election date is fast approaching, the Commission wishes to advise the leaders of political parties to start compiling the lists of your party agents for submission not later than 14 days to the election. In line with the timetable and schedule of activities for the 2019 General Elections, the deadline for Presidential and National Assembly elections is 1stFebruary 2019 while Governorship, State Assembly and FCT Area Council elections is 16thFebruary 2019. Very soon, the Commission will schedule a Train-the-Trainer Workshop for party agents. I urge you to nominate competent persons as master trainers capable of cascading the training to other party agents”. On money politics, he said as campaigns are going on nationwide, the Commission will keep very close watch on campaign finance. “In particular, we shall closely monitor spending by parties and candidates as well as individual and group donations to campaign organisations. We will discharge this regulatory responsibility diligently. The Commission has designed Campaign Finance Reporting Forms to ensure compliance with the reporting requirements by parties. The EC16C for annual finance reporting by parties, the EC16D for income (including contributions and donations) and EC16E on party expenditure are already available on the Commission’s website. “As elections approach, the Commission has to quickly finalise on the Guidelines and Regulations for the 2019 General Elections. In keeping with the Commission’s tradition to consult stakeholders, soft copies of the draft Guidelines and Regulations have been forwarded to all political parties through your official email accounts over a week ago. By making the document available ahead of this meeting, we hope that political parties would have studied it for discussion. We have also made one hard copy available to each party for this meeting. It is important to have your input at this meeting so that we can expeditiously finalise the document as well as the training manual for the general election. “Let me also seize this opportunity to reassure political parties that there is no change in the number of polling units and voting points used for the 2015 General Elections and the 2016 Area Council elections in the FCT as you will see from the register of voters to be presented to each party shortly. Any information to the contrary is utterly baseless and should be disregarded. “I cannot conclude my remarks without once addressing the worrisome issue of vote buying. The Commission has responded to the menace in three ways. First, we altered the configuration of our polling units by moving the ballot boxes closer to the voting cubicles in order to make it difficult for voters to expose their marked ballot papers. Secondly, we have introduced a partial ban on the use of mobile phone and other photographic devices by voters while in the voting cubicles. Thirdly, we are introducing the rolling and flattening of ballot papers by voters before casting them into the ballot boxes. “However, a new method of vote buying is being devised. We have received credible information that some partisan actors are now going round buying up PVCs from voters or financially inducing them to collect the Voter Identification Numbers (VIN) on their PVCs. In some instances, telephone numbers and details of bank accounts of voters have been collected. By collecting the PVCs, their intention may be to deprive the voters of voting since no one can vote without the PVC. By collecting their phone numbers and bank details, the intention is to induce voters by electronic transfer of funds to their accounts since it will be difficult to buy votes at polling units. By collecting the VINs, they may be acting on the mistaken notion that our system can be hacked into and the Card Readers somehow preloaded ahead of election and compromised. We want to reassure Nigerians that we are aware of the new tricks. It is a futile effort. We will work with the security agencies to deal with the violators of our electoral laws, including those who may be trying to compromise our staff responsible for making the PVCs available for collection by legitimate voters”, Yakubu vowed.